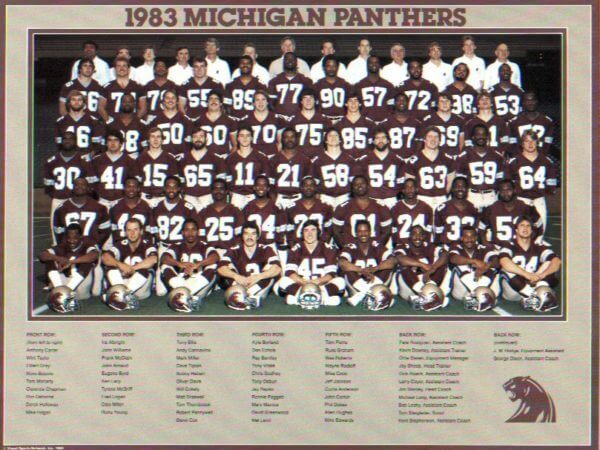 The Michigan Panthers were named as a charter member of the United States Football League (USFL) on May 11, 1982. A. Alfred Taubman, one of the nation’s leading real estate developers, headed the ownership group that included Judge Peter B. Spivak and Max M. Fisher. The Panthers named former CFL executive, Jim Spavital as their General Manager on August 26, 1982. Michigan then hired Jim Stanley as their Head Coach on November 18, 1982 after George Perles decided to coach at Michigan State. In the playoffs, the Panthers hosted the Western Division champion Oakland Invaders before a USFL-record crowd of 60,237. 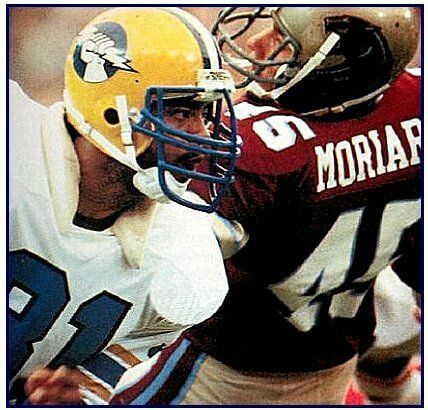 The Panthers’ decisive 37–21 victory vaulted them to the inaugural USFL Championship Game in Denver, Colorado. On July 17, 1983, the Panthers captured the USFL’s first championship with a 24–22 win over the Atlantic Division champion Philadelphia Stars. QB Bobby Hebert hit WR Anthony Carter on a 48-yard touchdown strike with 11:59 left in the fourth quarter for what proved to be the deciding score. Hebert was named MVP of the game, throwing for 319 yards and three touchdowns. It turned out to be the Panthers’ last game. After the 1984 season was over USFL owners, largely under the influence of New Jersey Generals owner Donald Trump and Chicago franchise owner Eddie Einhorn began talking seriously about moving to a fall schedule in 1986. While the Panthers had developed a loyal following, Taubman was a strong believer in the original spring football concept. He also had no desire to compete with the Detroit Lions, who were owned by his longtime friend William Clay Ford. The Panthers had been far more successful on the field than the Lions; at the time of the USFL’s founding, the Lions had tallied only three winning seasons since the NFL-AFL merger, and had only made the playoffs once in a non-strike year since winning their last league title in 1957. However, Taubman knew that he wouldn’t have even begun to be able to go head-to-head with the Lions even if he’d been inclined to do so. According to personnel director Mike Keller, the only colleges within reasonable driving distance of Detroit would not even consider opening their doors to a Panthers team playing in the fall, meaning that they would have had to play home games on Wednesdays or Thursdays. However, Taubman believed the Panthers would not have been able to get a lease for the Silverdome in the fall. Even before then, a study of market conditions concluded that despite having a decent following by USFL standards, the Panthers would have been “better off moving out of the Michigan market” due to exorbitant advertising rates and a fan base with little tolerance for losing. Taubman felt like the move was a foregone conclusion. As a result, after the merger between the Oakland Invaders and the Oklahoma Outlaws collapsed, Taubman quietly approached Invaders owner Tad Taube about a possible merger with his Panthers. When the league owners met to vote on moving to the fall, Taubman sent his son with a message for the commissioner—if the teams voted to move to the fall, the Panthers would merge with the Invaders, with the Invaders as the surviving team. When the vote to play in the fall passed, the Panthers and Invaders announced their merger, with Taubman as majority owner of the Invaders. 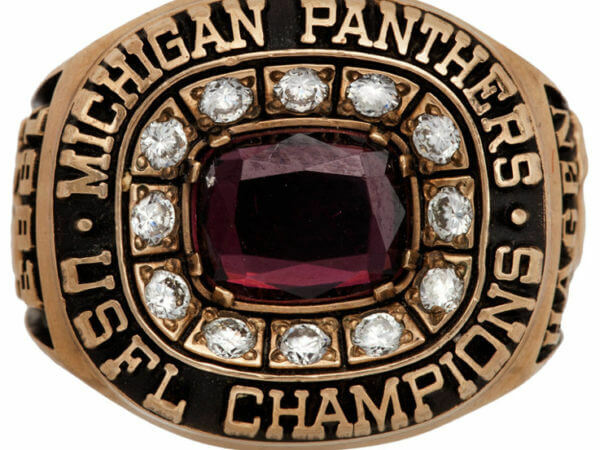 The Michigan Panthers were a professional American football team that played in the United States Football League (USFL) from 1983 through 1984. Panthers – A black panther is typically a melanistic color variant of any Panthera species. After the merger between the Oakland Invaders and the Oklahoma Outlaws collapsed, Taubman quietly approached Invaders owner Tad Taube about a possible merger with his Panthers. Who is the greatest Michigan Panthers?